For a new modern American option, check out Evanston’s Boltwood, a farm-to-table spot from Brian Huston (ex-The Publican), showcasing everything from pristine oysters to aged sirloin with winter squash, black garlic and caperberry gremolata, and roasted pears with orange cake, figs and toasted almond ice cream. Expect interesting, but unfussy, sips to go with. Boltwood, 804 Davis St., Evanston, IL 60201, 847-859-2880. Chef Homaro Cantu (iNG, Moto) has opened Berrista, a coffeehouse in the Old Irving Park neighborhood. While specifics have been fairly limited, the "miracle berry" is expected to be featured, along with donuts, sodas and chicken on a cheddar-bacon waffle with maple mustard. Berrista, 4219 W. Irving Park Rd., Chicago, IL 60641, no phone. Takito’s Mario Ponce and Anshul Mangal plan to open counter-service ramen spot Furious Spoon, with Shin Thompson (Bonsoiree, Kabocha) in the kitchen. Thompson will make the noodles in-house, using a machine he brought back from Japan. Expect a handful of varieties, along with saké and beer, when it opens in February in the Wicker Park neighborhood. Furious Spoon, 1571 N. Milwaukee Ave., Chicago, IL 60622, no phone. For an updated take on Italian, give Billy Lawless' (The Gage) Acanto a whirl. Situated in the former Henri spot, you can bet something sustaining is on hand, whether you settle on suckling pig or creamy duck egg spaghetti with spicy ground pork, pearl onions and rapini, all courtesy of Chris Gawronski. Acanto, 18 S. Michigan Ave., Chicago, IL 60603, 312-578-0763. Boka Restaurant Group (Girl & The Goat, GT Fish & Oyster) has opened Momotaro, a three-story Japanese joint in a former warehouse in the West Loop. D.C. transplant Mark Hellyar (Citronelle, Nora, and Blue Duck Tavern) handles the kitchen concoctions, while Jeff Ramsey (Tapas Molecular Bar in Tokyo) tackles the sushi. Momotaro, 820 W. Lake St., Chicago, IL 60607, 312-733-4818. “Top Chef” contestant Spike Mendelsohn (also of "Midnight Feast”) plans to open an offshoot of Good Stuff Eatery at 22 S. Wabash Ave. in the Loop. Good Stuff Eatery, 22 S. Wabash Ave., Chicago, IL 60603, no phone. Steve Morgan (ex-Alinea) will be the wine director at the soon-to-open red sauce spot Formento's, which comes courtesy of The Bristol crew. Formento's, 925 W. Randolph St., Chicago, IL 60607, no phone. Dan Marquis, the former executive chef at Quay, moved on to head the kitchen at Epic. Epic, 112 W. Hubbard St., Chicago, IL 60654, 312-222-4940. Aaron Browning (Koda, Tavernita) replaced Gray McNally as the chef at clubby, classic Chicago-inspired Tortoise Club. Tortoise Club, 350 N. State St., Chicago, IL 60654, 312-755-1700. Chrissy Camba’s Laughing Bird closed after just five months in business. As of now, she plans to open a dumpling house elsewhere in the near future. Laughing Bird, 4514 N. Lincoln Ave., Chicago, IL 60625, no phone. Homaro Cantu’s West Loop eatery iNG has closed its doors. iNG, 951 W. Fulton Market, Chicago, IL 60607, no phone. 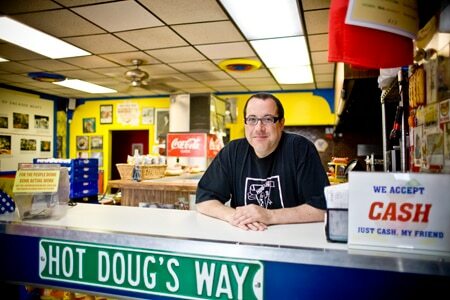 It’s official, and heart-wrenching for Chicagoans: wildly popular Hot Doug’s is officially closed. A burger joint will open in its place. Hot Doug’s, 3324 N. California Ave., Chicago, IL 60618, no phone.